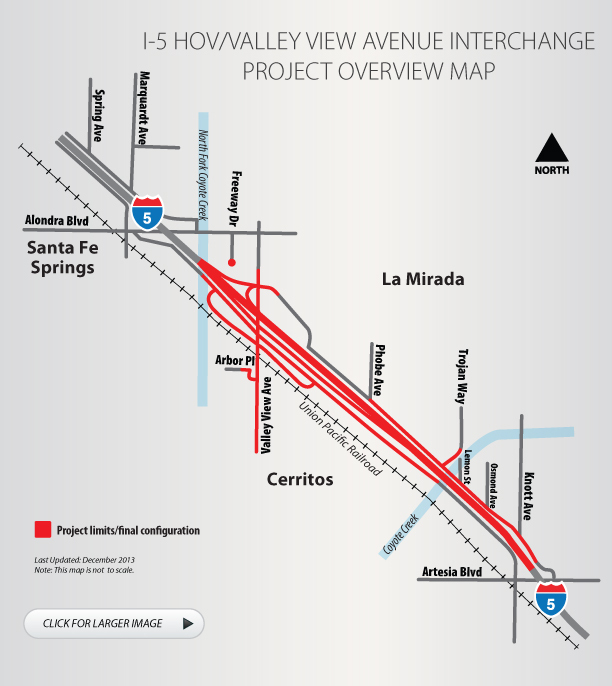 Improvements: HOV lane, one mixed-flow lane in each direction, interchange modifications at Valley View Avenue and Artesia Boulevard, frontage road modifications. In mid-November of 2016 Caltrans began construction on the Valley View Avenue Interchange Project, which will add a High Occupancy Vehicle and mixed-flow lane in each direction along approximately one and a half miles of I-5 at Valley View Avenue, from Artesia Boulevard undercrossing to North Fork Coyote Creek. The project extends through the cities of Buena Park, La Mirada, Cerritos, and Santa Fe Springs. Three bridges will be reconstructed: the Valley View Avenue Bridge at I-5, the North Firestone Boulevard Bridge over Coyote Creek, and the I-5 freeway bridge at Coyote Creek. Lanes will be kept open on the Valley View Avenue Bridge during construction. There will also be improvements to the interchange at Valley View Avenue and adjacent frontage roads. The new bridge will include a railroad overpass. Construction on this project is 39% complete. Completion of first half of Valley View Ave. Bridge: Revised to *late 2019. Completion of second half of Valley View Ave. Bridge: Revised to *late 2021. Completion of entire I-5 Valley View Ave. Interchange project: Revised to *late 2021. Also, please go to our Twitter page at twitter.com/My5LA for project updates. The Valley View Ave. Bridge over Arbor Place in Cerritos. October 2. Deck of bridge facing north. October 2. Deck of bridge facing south. October 2. 1. Turn left onto Firestone Blvd, from the off ramp. (Right turn only permitted). Click through to sign up for our construction notices regarding work on the Los Angeles I-5 Freeway Construction Projects.